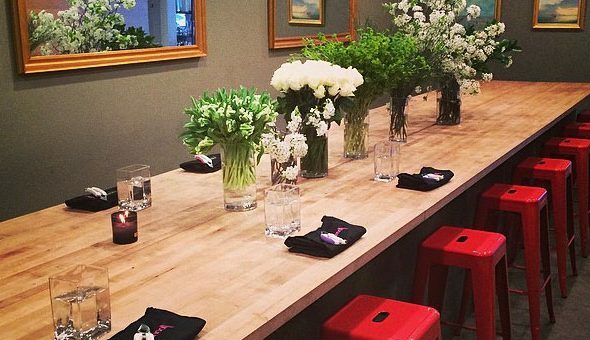 FlowerSchool New York offers private and corporate event opportunities for your next party or professional gathering. We provide an authentic experience that will inspire, impress and celebrate New York floral design with your community. FlowerSchool New York alumni have exclusive access to our Chelsea studio for wedding consultations, event preparation, or to host small events. FlowerSchool New York alumni have exclusive access to our Chelsea studio for wedding consultations, event preparation, or to host small events. This is a perfect opportunity to use the studio as a jumping-off point for your business. Rather than working from your home, create a professional first impression from the unique and familiar FlowerSchool New York space. Only one individual will be allowed to rent the space at a time. There will be no double bookings. You must be present for the event, activity or meeting. Rentals can not be redirected to another friend or colleauge. Alumni must supply their own vases, but are allowed to use tools available at the studio. Renters must attend a brief review of facility procedures before having access to the space. Clean up is requried after each event. Client consultations are free of charge during normal office hours. FSNY studio rental is $250 per day. Please contact Brittany Bosch at Brittany@flowerschoolny.com for availability.